The Media Standards Trust was formed in 2006. Media Standards Trust hosts debates about standards in the news media, conducts research into areas it considers of concern, hosts online projects, and formerly sponsored the Orwell Prize. In 2007 the MST founded journalisted.com. The site has an archive of over four million news articles and a database of the work, biographical and contact information of several thousand journalists. The site scrapes the news articles from several national and local publications, and sorts them according to byline. The database is utilized by the MST for conducting research into matters relating to news coverage; a weekly newsletter is published summarizing contemporary trends in news. In light of the June 2011 allegations of the News of the World journalists phone hacking into the mobile phone voice mail of murder victim Milly Dowler, on 5 July 2011 in partnership with Professor Brian Cathcart and other concerned individuals, MST formed the "Hacked Off" campaign, registering the site hackinginquiry.org, and campaigning for a public inquiry into phone hacking. The campaign was directly supported by Norman Fowler, Professor Onora O’Neill, Francis Wheen, Tom Watson MP, Ben Goldacre, Baroness Helena Kennedy, Sir David Bell, D. D. Guttenplan, Professor Roy Greenslade, Professor Ian Hargreaves, John Lloyd, Isabel Hilton, Ian Jack, John Pilger, John Prescott, Richard Peppiatt, Andreas Whittam Smith, J. K. Rowling, and others. Actor Hugh Grant supported the campaign and became a public spokesperson, appearing on Question Time and Newsnight. The campaign was criticised by The Register, which described it as a "secretive pressure group...of wealthy and powerful individuals and celebrities...which has successfully campaigned for state control of the media". In 2012, Hacked Off became independent of the Media Standards Trust. Hacked Off currently produces a magazine, Free & Fearless. Foundations which have contributed to the Media Standards Trust include Esmée Fairbairn Foundation, the Joseph Rowntree Charitable Trust, John D. and Catherine T. MacArthur Foundation, Nuffield Foundation, Eranda Foundation, and Scott Trust Limited. Individuals who have contributed to the Trust include Christopher Stone,[clarification needed] Robert Worcester. ^ "Media Standards Trust » About". mediastandardstrust.org. ^ "About - journalisted.com". journalisted.com. Retrieved 20 January 2015. ^ "journalisted.com". journalisted.com. Retrieved 20 January 2015. ^ "BBC News - Rowling writes new Harry Potter story". BBC News. Retrieved 20 January 2015. ^ "Media Standards Trust » Blog Archive » Hacked Off: Campaign for a Public Inquiry into Phone Hacking". mediastandardstrust.org. Retrieved 20 January 2015. ^ Page, Lewis (26 April 2013). "Announcement of 'churnalism detector' gets furiously churned". The Register. Retrieved 9 July 2013. ^ "Media Standards Trust website". Retrieved 10 September 2015. 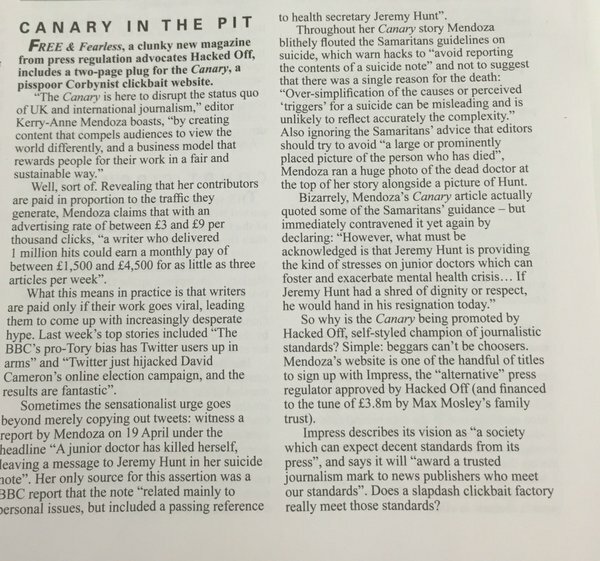 ^ "Canary in the Pit" (JPEG image). Private Eye (1418). Pressdram Ltd. 26 May 2016. p. 7. ^ "Media Standards Trust » Funding". mediastandardstrust.org. Retrieved 20 January 2015. ^ "Register Home Page". charity-commission.gov.uk. Retrieved 20 January 2015. ^ a b c "Media Standards Trust » People". mediastandardstrust.org. Retrieved 20 January 2015.